The Vampire Diaries, the television series based on the iconic books by L.J. Smith, has already managed to captivate millions of viewers with its unique mix of immortal romance and very human drama. 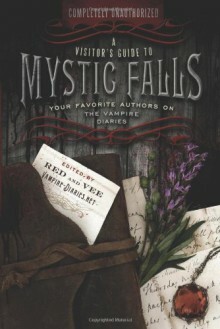 In A Visitor’s Guide to Mystic Falls, YA authorsled by Red and Vee of premier Vampire Diaries resource Vampire-Diaries.nettake a closer look at Mystic Falls: its residents (both alive and undead) and its rich, inescapable history. Claudia Gray delves into the events of 1864 and how they’ve shaped not just Mystic Falls but the success of the show itself Sarah Rees Brennan tells us what it takes for a girl to hold her own against a vampire boyfriend (or two), placing Elena squarely between fellow vampire-daters Buffy and Bella Jennifer Lynn Barnes takes Mystic Falls to task for poor treatment of Caroline Forbes Jon Skovron examines the male-female vampire dynamic, in history and in The Vampire Diaries Plus a guide to the book series for tv fans looking to visit The Vampire Diaries’ literary inspiration, and more Whether you’re a new visitor or a long-time fan, you won’t want to continue your tour of Mystic Falls without it. Great for all you Vampire Diary fans! I can't wait for this to be released! I love The Vampire Diaries series so this is a must for me!